Get aHEAD of your volatiles problem with HEADSPACEIn the world of volatiles analysis, Headspace Gas Chromatography Mass Spectrometry (HGCMS) supersedes its competitors through the direct injection of volatiles. Highly volatile and low boiling compounds are preferentially evolved from a sample into the headspace gas during gentle heating. This headspace is collected within a hermetically sealed vial and directly injected into the GC instrument. The direct injection of volatile compounds allows for removal of interfering solvent signals present when using other GC techniques. 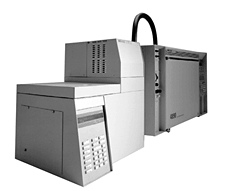 This also allows for increased sample size and improves the instrument's selectivity for components with higher vapor pressures. Direct injection of volatiles is a challenge no more!